The female lays 3 (2-4) pale greenish-blue eggs and incubates probably alone during two weeks. The chicks are fed by both parents, but male’s participation may vary. The young fledge between 13 and 25 days, from observations of two nests. They are also fed outside the nest by the adults. It has been suggested that the habit of suspending the nest in open space and often over water is defence behaviour against predators, and especially against lemurs and snakes. The Nelicourvi Weaver is locally to fairly common throughout the range. The species is vulnerable to deforestation, but as it frequents secondary and some artificial habitats, it is probably able to adapt to changes. The population is currently stable and not globally threatened. The Nelicourvi Weaver is evaluated as Least Concern. 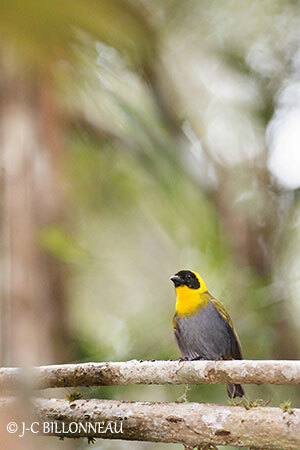 The Nelicourvi Weaver is endemic to Madagascar where it occurs in the eastern rainforest. It feeds mainly on insects, but nectar, seeds and fruits are also part of its diet. This solitary nester is monogamous. The male builds a bulky, suspended nest, and the female does the lining. Both parents feed the young. The population appears to be stable and the species is fairly common throughout the range. It is not globally threatened. 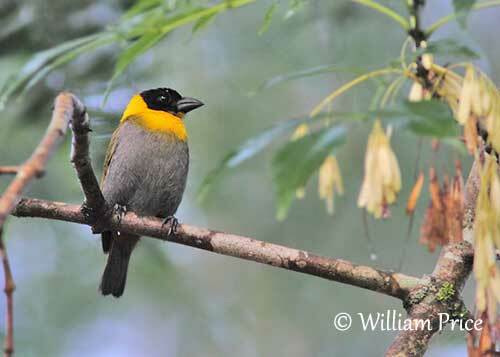 The Nelicourvi Weaver has uniform olive-green upperparts and upperwing-coverts. The tail is brownish-green. On the underparts, the chin is black. Throat and breast are yellow, extending as a yellow band around the nape, sometimes with bright orange wash. There is a narrow, olive-green collar across the upper breast. The lower breast, belly, flanks and tights are grey, but the undertail-coverts are bright chestnut. On the head, forehead and crown are black, extending down to ear-coverts and cheeks. The bill is black. The eyes are dark reddish-brown. Legs and feet are greyish. The adult female has mostly yellow head with dark lores. On the crown, an olive patch extends down behind the eye and onto the darker ear-coverts. The legs are greyish- or pinkish. The juvenile is usually duller than female with greyish head and some yellow on throat and above the eye. The bill is yellowish, sometimes with black patches. The adult’s non-breeding plumage is not completely sure, and may be only a variation of plumage of the immature male. The Nelicourvi Weaver is found in N, NW and E Madagascar. It occurs in the whole length of the rainforest belt, at Mt d’Ambre, and from Tsaratanana E to Sambava and S to Tolagnaro. The Nelicourvi Weaver is mainly found in rainforest from sea-level up to 2,000 metres of elevation, but it is commoner below 1,200 metres. It can be seen sometimes in adjacent plantations, secondary growths, forest edges and in gardens of villages close to the forest. It is also found in the eastern littoral forest on sandy soils. It favours the middle-storey, but it usually ranges from canopy to ground-cover. The Nelicourvi Weaver gives high-pitched, rasping « chizz chizz chizz” while feeding in groups. Other calls include “sit” or “chet”, also a nasal “tiang tiang” and “tsrrrreee” notes given by adults in or near the nest. The song is given by the bird hanging from the nest “chiz…chizzchswiriissssiszz”. The Nelicourvi Weaver feeds on various insects and other arthropods including spiders, coleopterans, hemipterans and orthopterans. But small fruits, seeds and nectar, and occasionally small lizards are also part of the diet. The chicks are fed on crickets, grasshoppers, beetles and caterpillars. A large prey is dismembered by adults before being given to the young. An observation describes the bird discarding the petals of small, white flowers, probably to get the nectar. It forages among twigs, on branches, in leaf tangles, and often hangs from them. It investigates rolled up leaves, probes into bark crevices and crushes dead herb stems to extract some hidden prey. It moves from canopy to lower forest levels. It often joins mixed-species foraging flocks, and it is often associated with the Long-billed Bernieria. But it is usually found alone or in pairs. 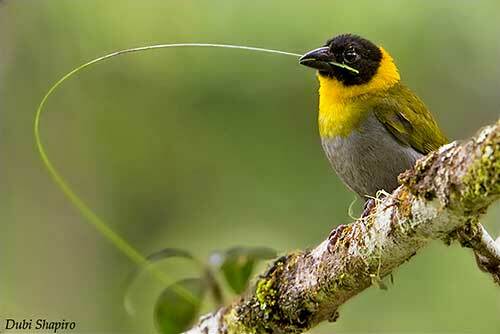 The Nelicourvi Weaver is monogamous with long-term pair-bond. It is solitary nester with the nests widely separated. During the breeding season, the male calls loudly from horizontal branch while the slightly dropping wings are shivering. It performs similar display while the female does the nest lining. The copulation occurs during the nest-building (observed on 6th day). The male guards the female against other males, and it may chase her during both nest-building and incubation. The Nelicourvi Weaver is probably resident on the island. The flight is fast with shallow wingbeats. The breeding season occurs between September and December. The Nelicourvi Weaver is solitary nester. The male builds a bulky nest with woven grass and palm fibres. There is an entrance tunnel of up to 20 centimetres long, leading to the oval nest chamber. This structure is attached to liana or bamboo, often 3-10 metres over clearing or stream. It is usually far from the surrounding vegetation and placed in open. The nest materials include grass, sedges and long palm fibres of up to 50 centimetres long. The lining is made with palm fibres. But the materials may change from one nest to the next.